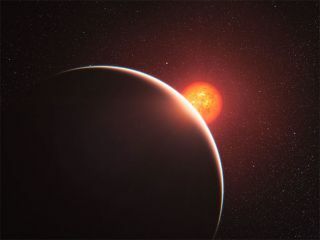 This artist’s impression shows the super-Earth exoplanet GJ 1214b passing in front of its faint red parent star. The exoplanet, orbiting a small star only 40 light-years away from us, has a mass about six times that of the Earth. GJ 1214b appears to be surrounded by an atmosphere that is either dominated by steam or blanketed by thick clouds or hazes. The first-ever analysis of the atmosphere of an alien planetclassified as a so-called "super-Earth" has revealed a distant worldthat is likely covered with either water vapor or a thick haze, scientistsannounced today (Dec. 1). "We're trying to get at: What's the main component ofthis planet's atmosphere?" said lead researcher Jacob Bean, an astronomerat the Harvard-Smithsonian Center for Astrophysics in Cambridge, Mass. GJ 1214b is called a super-Earthbecause it is larger than our home planet but smaller than gas giants likeJupiter and Saturn. It was first discovered in 2009 and has been studied eversince. Among our solar system's inhabitants, Neptune is the planetthat most closely resembles GJ 1214b, Bean said. The alien planet has a radius2.5 times the size of Earth's and has about 6.5 times the mass, researcherssaid. Astronomers have discovered morethan 500 alien planets beyond our solar system so far, with hundredsmore expected to be confirmed in upcoming months. Bean and his colleagues observed the system with the FORSinstrument on the European Southern Observatory's Very Large Telescope inChile. The instrument analyzes the spectrum of light from a target to determinethe object's composition. Rather than find a signal crawling with interestingelements, the scientists discovered that GJ 1214b's atmosphere bears arelatively flat, featureless signature. "That might seem a bit boring, but that's actually avery powerful constraint," Bean told SPACE.com. It means, for example, that the exoplanet's atmosphere can'tcontain much hydrogen, which typically leaves a strong feature in the spectrumof light coming from a planet. The astronomers concluded that the alien world's atmosphereis most likely dominated by water vapor or blanketed by a haze of clouds thatis blocking other chemicals underneath. "This isn't a definitive result, but it's veryexciting," Bean said. "It points the way toward the future." Although the prospect of water vapor may sound promising inthe search for extraterrestrial life, scientists said GJ 1214b is not acandidate for hosting life. That's because the planet is probably way too warmfor liquid water to exist in large quantities. "This planet has basically no potentiality forhabitability, whether it has a puffy atmosphere or a cloud atmosphere,"Bean said. Super-Earths are easier to detect than a relatively small,dim Earth-like planet would be, yet are more difficult to find than bright,large gas giants, so they represent the cutting edge in astronomers' ability tostudy planets beyond the solar system. "Super-Earths are really at the frontier of exoplanetresearch right now," Bean said. "We've gotten to the point where wecan finally discover and characterize these planets. I think over the next fewyears there's really going to be an explosion of work done in this area." The results of the study are detailed in tomorrow's (Dec. 2)issue of the journal Nature.